“Ieiunium Phasianis”, is a series of work which talks about hybridization (the process of combining different varieties of organisms to create a hybrid). The series includes three variations of “Ieiunium Phasianis” (Fast Pheasant), each variation getting closer to the moment where this hybrid takes flight. 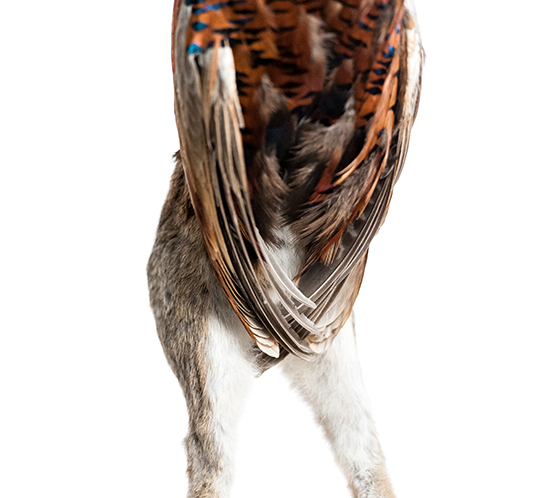 Pheasants are birds who find it difficult to take off at an ideal pace, but it appears as though the legs of a rabbit will speed up their hopes for escape. The idea of survival of the fittest, an element that exists everywhere on earth is also evident. I use this piece as a metaphor, referring to intricacies within humanity such as science, emigration and integration.